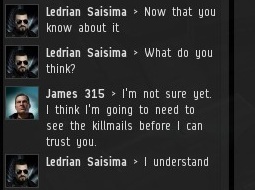 Previously, on MinerBumping... Ledrian Saisima outed himself as a spy after donating hundreds of millions of isk to the New Order. 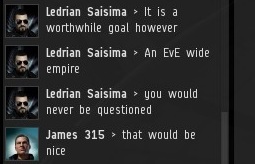 He explained that it was all part of his master plan to help the New Order take over all EVE by killing lowsec miners with a Drake. Ledrian revealed that he hadn't been after our "schedules". 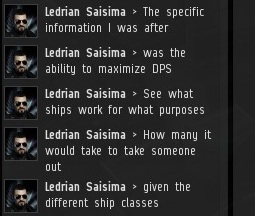 Instead, he gathered intel about maximizing DPS and how many ships were needed to kill people. Astute observers may be aware of the Gank page on this very website, which links to publicly-available posts on such topics. Again... The Gank page. Some people get their info the easy way, some the hard way. Ledrian understood that his spycraft came at a price. 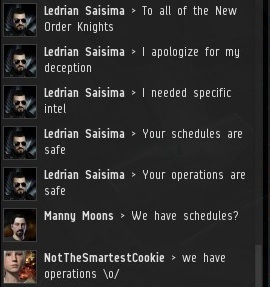 New Order Agents had become suspicious of Ledrian ever since he told them that he was a spy. 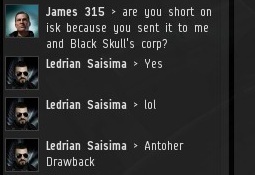 Armed with all of that information on how to properly gank miners in highsec, Ledrian was able to put together a good Drake fitting for ganking miners in lowsec. 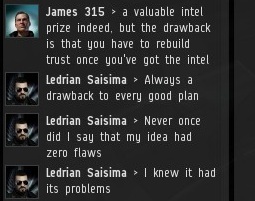 Unfortunately, Ledrian's isk reserves were all but tapped out. Gaining the trust needed to infiltrate the New Order had been very expensive. Having spelled out his master plan, Ledrian was eager to hear what I thought of it. 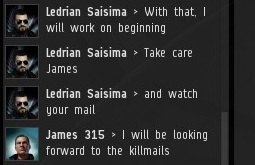 I told him I would reserve judgment until he supplied the promised killmails of lowsec miners. Putting Ledrian's plan into motion came at great personal cost to himself. But he was driven by the ambition to help me take over the whole EVE galaxy. At least his motives were pure. 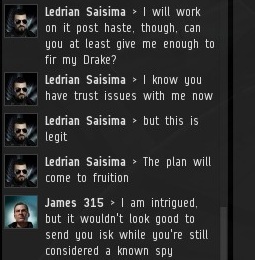 In the meantime, Ledrian hoped I could loan him funds for his anti-miner Drake. I politely declined, citing his "burned spy" status. Imagine the scandal if New Order funds were diverted to a rogue black ops operation. Since I had not yet banned him from New Order HQ, Ledrian returned to the channel and came clean. It was nothing personal. Ledrian vowed not to use any of the intel against us. 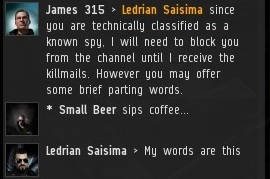 Before his expulsion became official, Ledrian was given the opportunity to deliver a final message directly to my Agents. Playing to the audience, Ledrian declared his fealty to me and the New Order. Always a crowd-pleaser. 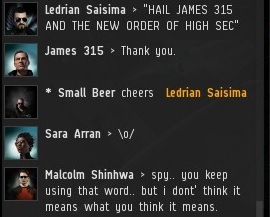 Now it was time for Ledrian to unleash himself upon an unsuspecting lowsec--after he grinded some isk for his Drake, that is. But would Ledrian succeed in helping the New Order take over EVE? Or would Ledrian's master plan, years in the making, unravel before his very eyes? Ledrian that boy sure is special. 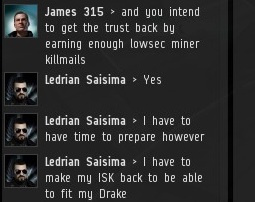 I hear afk ice mining is a good way to make isk. 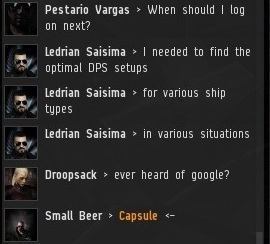 Decided against helping explain what to do when travelling through lowsec for fellow pirates. Ledrian, you should have asked if anyone in NO would be willing to help. I'm sure some people would have been. But, now you get to do it solo. I am so looking forward to the next chapter in this book of crazy. So...let me see if I have this right. Instead of just joining the New Order as a legitimate Knight & learn everything he needs to know about ganking by, you know, actually joining us ganking non compliant miners. He 'infiltrates' the New Order ranks in a stealthy manner, gives away all his isk to ingratiate his undercoverness with management then, before he has accomplished his spai goals, he outs himself as a Spai, gets officially categorized as an outsider by New Order management & banned from communicating on official New Order channels. 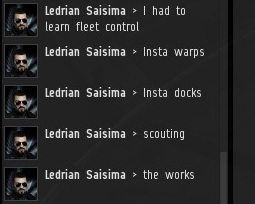 Now he has to figure out how to replace the isk he gave away so he can finance his low sec campaign & set up a forum to learn from New Order Knights how to fit gank ships! Genius I tell you! Pure genius! I hope the New Order is not liable for Ledrian's therapy bill, that could bankrupt the lot of us. For fitting advice Ledrian may I suggest the most excellent film "Condorman" (1981) starring Michael Crawford, Oliver Reed, and Barbara Carrera. It's an excellent spy movie with plenty of tips and tricks for the budding spy to learn from. There are some incredible build ideas in that movie. Just one Drake right? Like James' invincible stabber, only a drake right? Does someone have a drake equivalent to "My raven was equipped with the following"? I met some gankers. They were quite offend when I mistook them for the New Order. They called you rank amateurs. I suppose you should be flattered they know you so well. You don't need intel to know what is common knowledge.